A physiotherapist, Mr. Vincent Shoetan, says women who wear high heeled shoes on a regular basis risk the chances of developing knee problems, including arthritis and back pains in future. 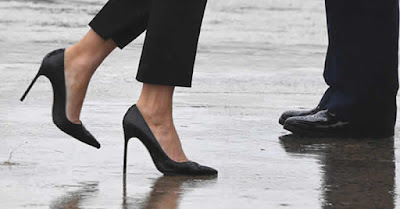 Shoetan, who spoke to the News Agency of Nigeria on Friday in Lagos, advised women, who want to wear high heeled shoes not to wear them for an extended period. This, according to him, is to avoid developing complications associated with such types of shoes. “If you want to wear high heels, don’t wear them for long because high heels generally distort the body’s anatomy, right from the foot. “The weight of the body ends at the heels of the foot; it’s from the heels that the weight goes down to the ground. “When you wear high heels, your heels will no longer touch the ground; what happens next is that your weight is now brought forward to your toes. And because of that, the pressure is now on your knees. “Again, it comes down to giving you problems in the future by causing knee problems. It can lead to knee pains, arthritis of the knees and of the back. “It will definitely lead to knee problems, and for some people, back problems. “So, that’s why we always advise that we wear flat shoes; not necessarily flat all the time, but if you are going to wear heels, don’t wear them for a very long time. Plantar fasciitis is one of the most common causes of heel pain, and the condition involves inflammation of a thick band of tissue that runs across the bottom of a woman’s foot and connects the heel bone to the toes.